Shareholders got much-needed good news this week from one of Celgene's key collaboration partners. Celgene Corp. (NASDAQ:CELG) investors would probably like a few do-overs given the company's stumbles over the past year. First, it suffered a key clinical-trial failure that forced it to ratchet back its long-term sales outlook. Then, the FDA sent it an embarrassing Refusal to File letter for its most-anticipated drug, ozanimod. The setbacks have increased the pressure on the company to deliver a win, and fortunately, that win came in the form of positive pivotal-stage trial results for luspatercept, a drug that Celgene has licensed from Acceleron Pharma (NASDAQ:XLRN). On Thursday, the companies announced that luspatercept's late-stage study in myelodysplastic syndromes (MDS) panned out, clearing the way for filings for approval next year. How big is this win for Celgene? Luspatercept addresses chronic anemia in MDS by promoting the production of healthy red blood cells and regulating TGF-beta proteins involved in the late stages of creating red blood cells. The aim is to improve red blood cell counts to reduce the need for blood transfusions, which can expose MDS patients to iron overload that may damage organs and take a toll on quality of life. In phase 3 trials, luspatercept met its primary endpoint of eliminating the need for red blood cell transfusions for at least eight consecutive weeks during the first 24 weeks of treatment versus placebo. It also met a secondary endpoint of eliminating transfusions for at least 12 consecutive weeks during the first 24 weeks. A more complete review of the data from the trial will be revealed at a future industry conference, but the headline success has the companies planning to file for an approval in the U.S. and Europe early next year. It also boosts optimism that a late-stage study evaluating luspatercept in beta thalassemia, another condition that requires regular blood transfusions, may be a success. Data in beta thalassemia should be available soon. Celgene's long been favored by investors for providing a consistent streak of commercial and clinical-stage wins. The string of successes includes the approval of the megablockbuster multiple myeloma drug Revlimid, as well as the approval of billion-dollar blockbuster multiple myeloma drug Pomalyst, psoriasis drug Otezla, and pancreatic cancer drug Abraxane. 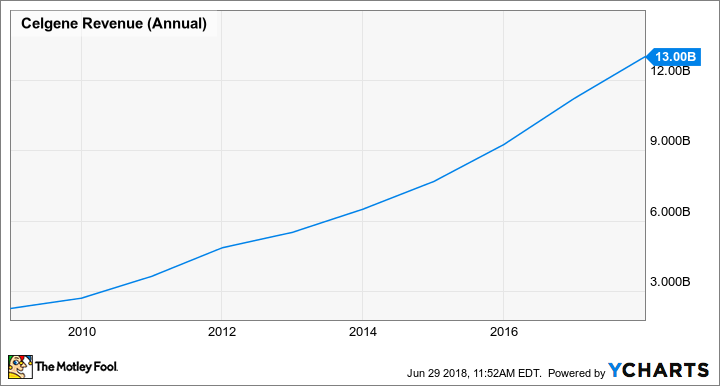 The success of those drugs has catapulted Celgene's sales from less than $3 billion in 2010 to about $13 billion in 2017, and it's provided management with enough confidence to project compound annual revenue growth of about 14.5% between 2017 and 2020. CELG Revenue (Annual) data by YCharts. Achieving its future revenue target has been called into question lately, though. The failure of GED-0301 in Crohn's disease in 2017 resulted in management reducing the low end of its 2020 revenue target from $21 billion to $19 billion, and although management is sticking with its 2020 outlook so far, ozanimod's Refusal to File letter has created doubt that forward guidance won't have to be cut again. Acceleron's luspatercept data helps assuage some of the doubt. Earlier this year, Celgene had listed luspatercept as a peak sales opportunity in excess of $2 billion. There's no guarantee that luspatercept will win FDA approval, but I'm pretty certain that if luspatercept's trial was a flop, investors would have sent Celgene's shares reeling given the company's estimate of the drug's potential. Although MDS and beta thalassemia aren't common, there are still tens of thousands of patients that could benefit from luspatercept, and since current treatment, including transfusions, can drive the cost per patient in these indications into the hundreds of thousands of dollars per year, there's plenty of reason to be optimistic that luspatercept will be a commercial success. Luspatercept's beta-thalassemia data should be reported soon, and if that data is positive, then it will add further conviction to the thinking that the drug will be a winner. However, that's not the only clinical-stage drug that could rekindle investors' interest in Celgene. Celgene is working with bluebird bio (NASDAQ:BLUE) on bb2121, a chimeric antigen receptor T-cell (CAR-T) therapy for use in multiple myeloma. Initially, bb2121 is being studied in the fourth-line or higher setting, where there's a significant need for new treatment. However, data observed so far suggests that it may eventually wind up being a successor to Revlimid and Pomalyst. In June, Celgene and Bluebird reported a 95% overall response rate to bb2121 among patients who had previously received a median seven prior multiple myeloma treatments. Importantly, 50% were complete responders and progression-free survival was nearly one year, a remarkable improvement over the few months witnessed historically in this patient group. Data that could support a filing for approval is expected next year and if it's good, then bb2121 has a very good shot at becoming a blockbuster. Celgene's also got JCAR017 working its way toward regulators. A CAR-T for use in non-Hodgkin lymphoma patients, JCAR017 could wind up being best-in-class in terms of safety. So far, the rates of life-threatening cytokine release syndrome and neurotoxicity have been lower for JCAR017 than competing CAR-T's Yescarta and Kymriah, both of which have already won a regulatory OK. Depending on the data, Celgene could file JCAR017 for approval next year. Additionally, Celgene plans to file for approval of fedratinib soon. Celgene acquired that drug when it bought Impact Bio earlier this year, and if approved, it could wind up competing against the blockbuster drug Jakafi as early as 2019. Finally, Celgene believes it can refile ozanimod for approval in multiple sclerosis early in 2019. If that drug is approved, it will compete for sales against the $3 billion-per-year Gilenya. Such an outcome could lead to the company quickly finding itself back in investors' good graces.